As my mom would say: “Oh honey, it was so sad.” I was on my way to teach a quilting class at my LQS last week, and had a big plastic bin of things to share with me. It’s been a long, gross winter, and that day it was raining and foggy. All the parking lots around us are covered in a thick layer of sand and salt, car grease and exhaust, and it was just plain yucky out. Unloading my car, I was so grateful I got a spot by the door long enough to unload my quilts… and that’s when it happened. My hand slipped, and the box of quilts tumbled onto the ground and flipped over, spilling the top quits out on to the nasty pavement. I picked them up as quickly as I could, but still was not quick enough to keep some of them from getting very dirty. Oh honey, it was so sad. One of them, a little pillow slip from my book, Wanderlust Quilts, was also in that fall. 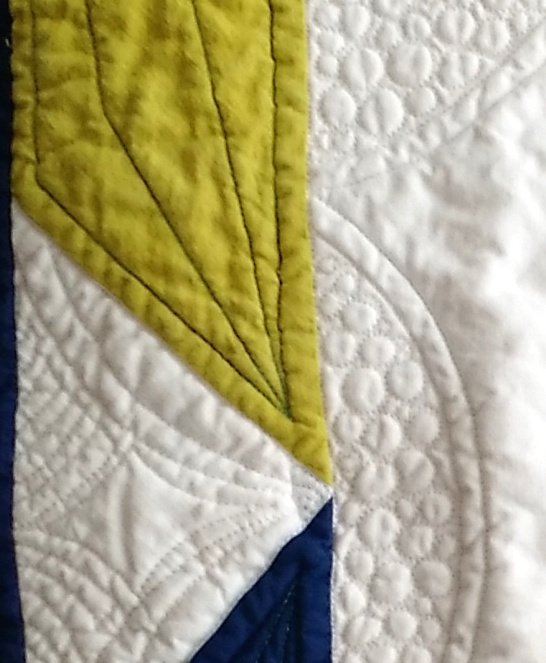 I had brought is as an example of my quilting choices, and also to show that I often use pillows for testing out ideas. For upcoming book talks and things like that, though, that was not good because it still needs to be pretty! I washed it out with handsoap in the sink, and was deeply grateful the black and gunk came off of it… and soon after had a horrible sinking feeling that the hand dyed fabric I had prewashed was actually bleeding all over the lovely white background. Before. The whole thing was like this, and the blue on the other side bled as well. So after pulling myself together, I wrung it out, laid it over the back of a chair, and taught my class. Then I refused to look at it for 4 days, and in that time, it had dried out and I was sure that stuff was permanent, but it turns out, my method took it right out. I hope this method helps you, if you’re ever in this kind of a bind. 1) Wet the section (or the whole darn thing) by hand under warm water, then add a couple of drops of Dawn dish soap on that area. Not the fancy stuff, the old school, basic, cheapest of cheap Dawn dish detergents. (some of you may recall this is how I prewash batiks and hand dyes, usually). Gently work it in, because you don’t want to raise the nap on your fabric by scratching at it. 2) Rinse thoroughly, then toss in the wash with a bit of detergent (I use Charlie’s Soap, which is an environmentally safe, non-toxic detergent that was formulated for use in the garment industry. It’s really great at removing excess dye. And cleaning baby diapers.) and a Color Catcher if you’re paranoid. Which I was. By the way, no affiliation, just have been using it for the last 8 years, and love it. 3) At this point, my project was stray-dye free, so I felt comfortable drying it as I normally would. All better! It’s still a little damp in this picture, so that blue shadow will go away as it dries. I’m telling you, Dawn, or Dawn + Charlie’s Soap and a color catcher are AWESOME. They also remove red dye from bleeding batiks (ask me how I know). I hope this helps you out, if you ever are in a bind! very sad that you dropped them but thank goodness for Dawn and Charlie !! and thanks so much for passing on your tips, its always so fabulous to know how to solve problems like these! I don’t know what I would do w/o that dish soap!!!!!! I’m so glad that it worked for you!!!!!!! I’ve used Dawn and Country Save (also a free-from-everything diaper safe soap) and Color Catchers and had the same luck – thank goodness for “easy” fixes : ) I’m so glad your piece was saved! Pinning this cause I know I’ll need it in a panic pinch some day. Thanks so much for all the details on how you handle this potential catastrophic moment…at least that’s how it feels when you first spot it, right? I am sad to admit that it’s happened more than once! But this process really does work. Thanks for pinning! I have never heard of Charlie’s detergent. I need to go check it out. Thanks for sharing! Hooray for Dawn & Charlie! That moment…that moment when you see bleed happening. Ugh. Glad you had a fix! Great tip, thanks! I’ve used color catchers but have never tried Dawn. It was necessity first, but then I realized how well it worked! It even got red dye from a rug out of white curtains. Great post that I’m going to pin as well. One question though…do you wash the rinsed piece in the washing machine with Charlie’s Soap, or hand wash? Just wondering. Thanks, Jennifer! With this pillow, the whole thing ended up wet, so I just finished it by hand. If you feel the rest of your fabrics won’t bleed, I would toss it in the wash, no problem.